Child Care Leave Moe. What about child care leave in Japan ? Short time working Papa and Mama raised holiday plus By 「 Revision of the child care and. 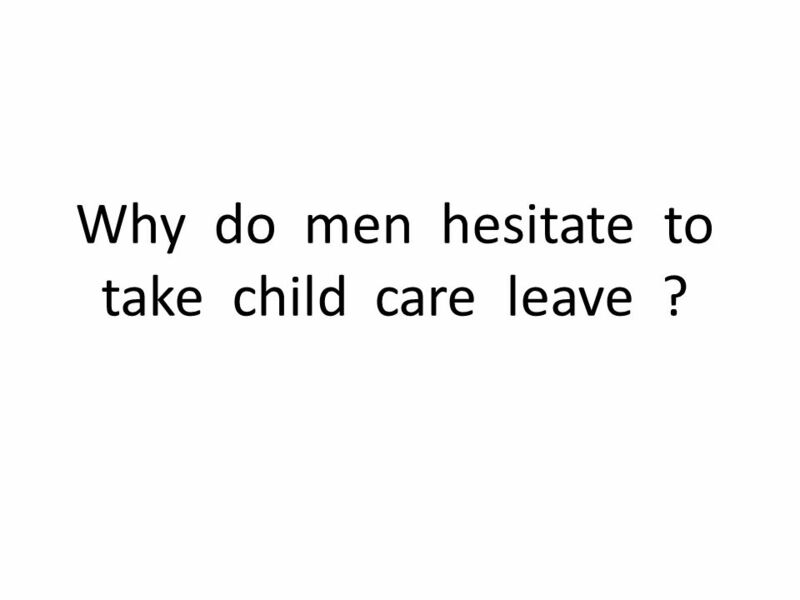 4 Why do men hesitate to take child care leave ? 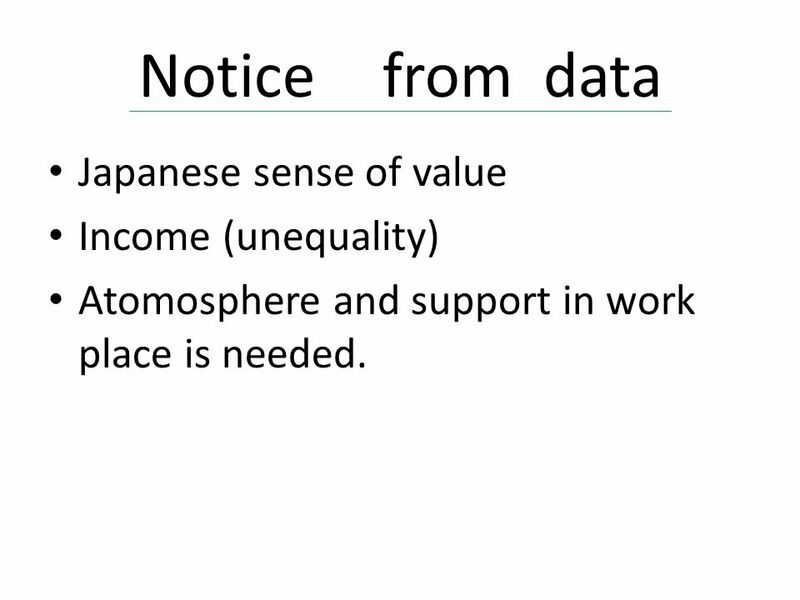 6 Notice from data Japanese sense of value Income (unequality) Atomosphere and support in work place is needed. 7 What about in other country ? 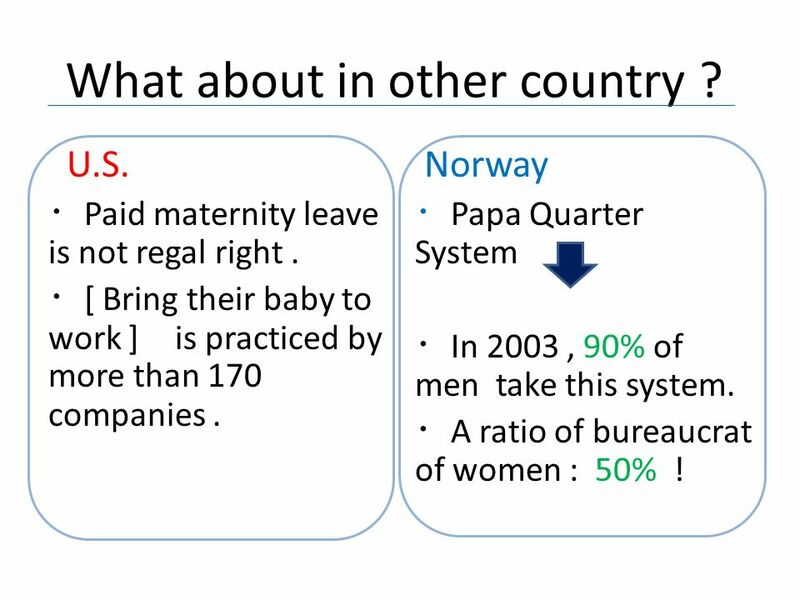 U.S. ・ Paid maternity leave is not regal right. ・ [ Bring their baby to work ] is practiced by more than 170 companies. 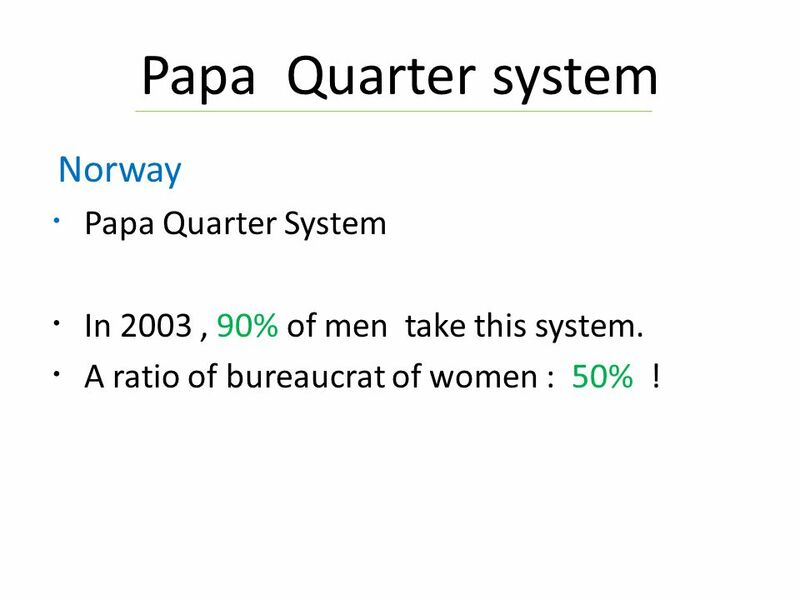 Norway ・ Papa Quarter System ・ In 2003, 90% of men take this system. ・ A ratio of bureaucrat of women : 50% ! 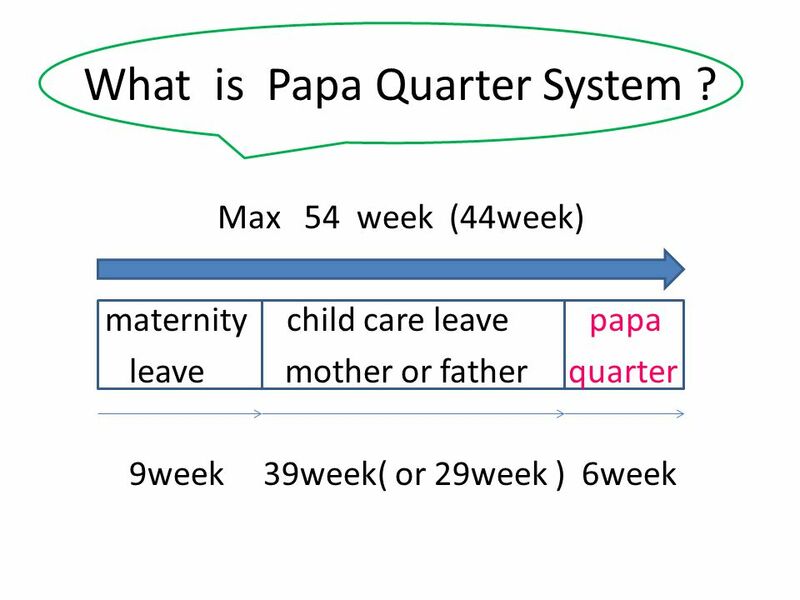 8 Papa Quarter system Norway ・ Papa Quarter System ・ In 2003, 90% of men take this system. ・ A ratio of bureaucrat of women : 50% ! 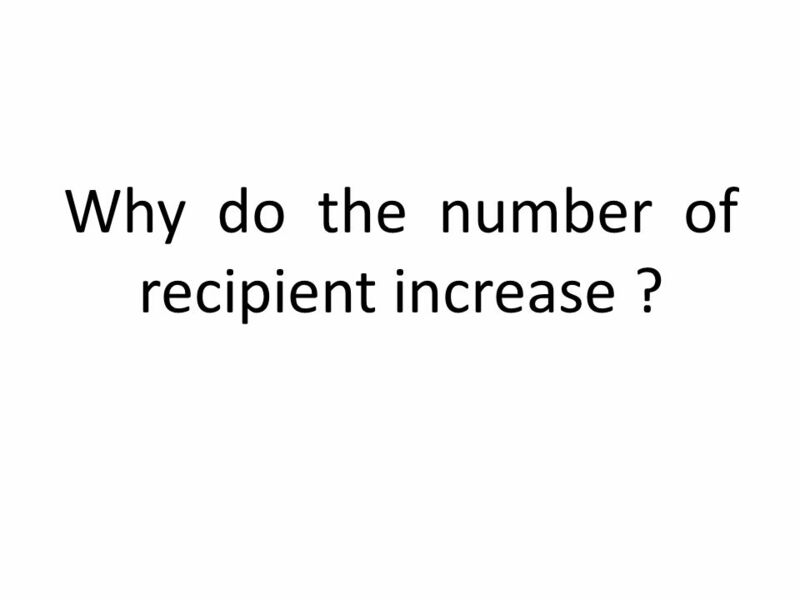 10 Why do the number of recipient increase ? 11 The measure of the company Fx. SHISEIDO ・ Offer the system ： offer the system which can master various skills, such as English, through the internet during maternity leave. ・ Kangaroom Shiodome : This is a child care facility where open from 8:00 am to 7:00 pm. 12 What should be done from now on? 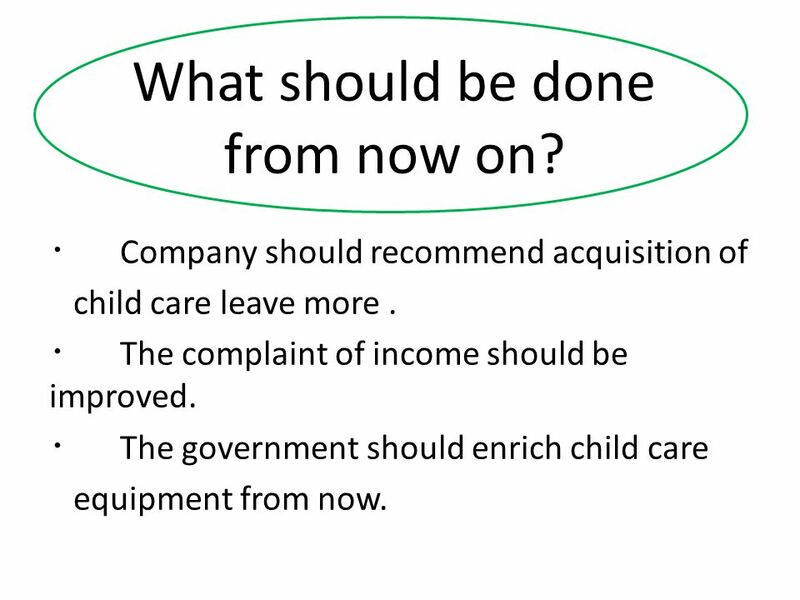 ・ Company should recommend acquisition of child care leave more. 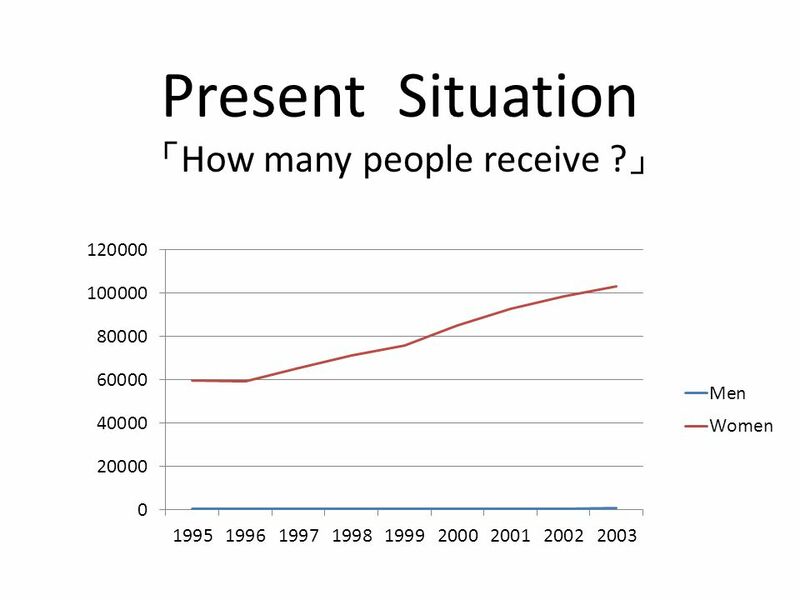 ・ The complaint of income should be improved. ・ The government should enrich child care equipment from now. 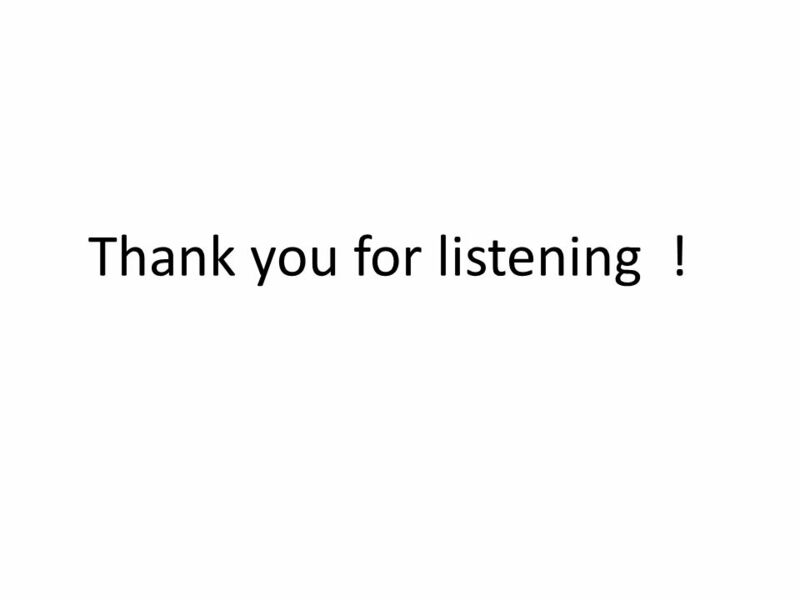 13 Thank you for listening ! 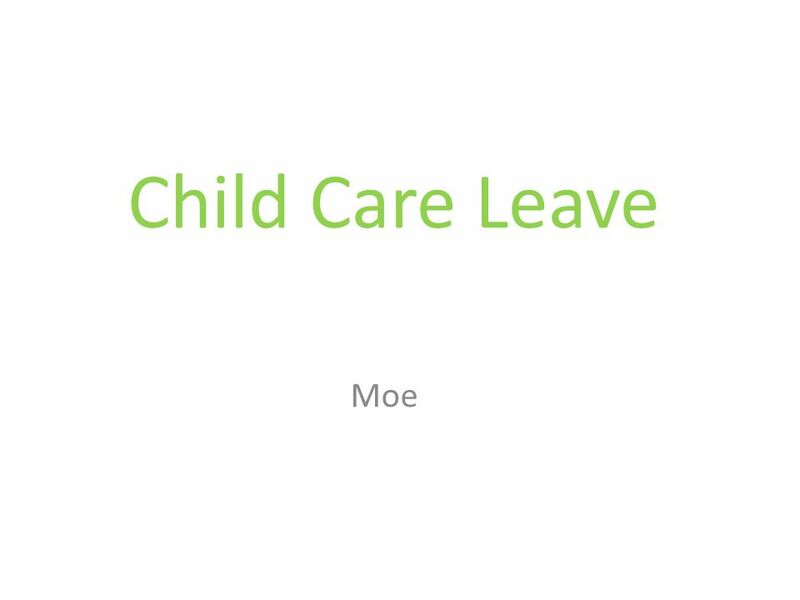 Download ppt "Child Care Leave Moe. What about child care leave in Japan ? Short time working Papa and Mama raised holiday plus By 「 Revision of the child care and." JAPANESE FATHERS INVOLVEMENT IN CHILDCARE Masako Ishii-Kuntz, Ph.D. Department of Sociology University of California, Riverside. Marion Macleod Senior Policy and Parliamentary Officer. Aleksandra Kanjuo Mrčela and Nevenka Černigoj Sadar Faculty for Social Sciences, University of Ljubljana 9th International Network on Leave Policies and. Fathers and Parental Leave Policies: International comparisons Margaret OBrien Centre for Research on the Child and Family, University of East Anglia. ACHPER NSW OPTION 3 INDIVIDUALS AND WORK 2009. Having it All?. Women on the Verge Why We Are Where We Are And Where We Go From Here. Embedding our Learning Offer: Gloucestershire Libraries & Information. School nursing – a fresh look Learning more about this unique career may surprise you. School nursing has changed a lot - and it’s still changing. June. Estonian Leave Policies 2014 Tallinn seminar Katre Pall. The Issue of Work-Life Balance in Bulgaria Siyka Kovacheva University of Plovdiv Bulgaria. Sweden Ann-Zofie Duvander Centre for studies of Social Policy and Family Dynamics in Europe (SPaDE) Demography unit, Dept. of Sociology, Stockholm University. Brailes & Winderton Parish Council Childcare Needs Survey October 2014 Ascot, Whichford, Cherington, Stourton, Brailes, Sutton under Brailes & Winderton. 27 th February 2013 Closing the Gender Gap ACT NOW Ana LLENA-NOZAL Economist, Social Policy Division, OECD. Ministry of Employment Sweden Parental leave in Sweden Hanna Björknäs Division of labour law and work environment Ministry of Employment. MATERNITY LEAVE A Lightning Talk by Ellen Blumhardt. Equality in Norway. Short history introduction of Norway. Some «bits and pieces» from Norwegian laws A little bit of statistics. SITUATION ANALYSIS AND IDENTIFICATION OF NEEDS IN THE AREA OF FAMILY POLICY IN SLOVENIA Ružica Boškić Child Observatory Social protection Institute of. 2 The Youngest Americans / A report by The Robert R. McCormick Foundation and Child Trends.